Tongue twisters, as you probably know, are silly poems that use very similar sounds. They’re especially popular with children. Famous American picture books, like Fox in Socks, delight kids with tongue twisters that are hard (but fun) to read out loud. Children like to recite these poems for fun, but they can serve a very real use for people studying English as a second language. For example, the tongue twister above about selling seashells could be especially useful to ESL students, because it contrasts the similar “s” and “sh” sounds in English. The tongue twister about Peter Piper is a great way to practice English vowels; it puts different sounding vowels between similar-sounding consonants. It also combines vowels with “r,” a vowel-consonant combo that’s common in English but rare in a lot of other languages. Tongue twisters aren’t just for learning English vowels and consonants – they can help you master the vowels and consonants of any language. Korean offers a lot of tongue twisters that focus on consonant repetition and vowel contrast. Korean tongue twisters also frequently contrast two similar sounding family names. This is very useful for students who are learning Korean, because Korean family names are universally one-syllable, and often differ in just one vowel or consonant. Gan-jang gong-jang gong-jang jang-eun gang gong-jang-jang i-go dwayn-jang gong-jang gong-jang jang-eun Jang gong-jang-jang i-da. Loo loo loo loo loo la-oo. Here’s a video tutorial with proper tonal reading of the sentence. Those were just a few examples of pronunciation tongue twisters. On the web, you can find tongue twisters in just about any language you’d like to study, focusing on nearly any kind of sound you need to practice. Two of the best international tongue twister portals found on the web are the ones from Omniglot’s world language encyclopedia, and the 1st International Collection of Tongue Twisters on Uebersetzung Translation Service’s website. 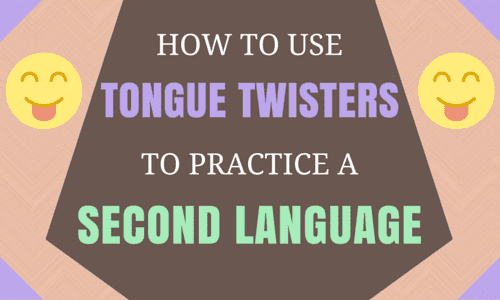 If you’re taking language lessons, be sure to also ask your tutor about language-learning tongue twisters. This post was written by David Recine, ESL and TOEFL expert at Magoosh. You can learn more about the TOEFL in Magoosh’s What is the TOEFL? infographic.